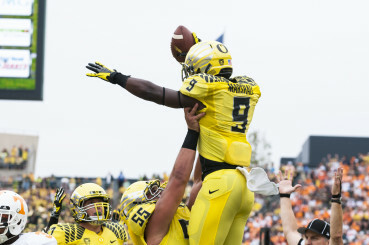 The University of Oregon is not often thought of as a hot bed for NFL talent. Mainly because of the lack of “can’t miss” prospects and the issues some of the “draft experts” have with the no huddle system we use to win more football games than any other school since 2010. But that’s an argument for another time. The reality is that Oregon has produced many solid NFL starters and role players. With the current total of pro Ducks up to 37, including the most Super Bowl XLIX starters out of any college program with 4. With the Super Bowl over, it is that time of year again when the last football has been snapped and the long 7-month drought until the next season begins. To fill the void that this has left in all of our lives, we take this time to look ahead — to the next crop of recruits that will be the stars of the next college season, and to the NFL Draft where amateurs become pros and life-long dreams are realized. Duck fans, as well as football fans everywhere, probably know who the top NFL prospect to come out of Oregon is this year. What many do not know, however, is the vast number of future NFL players still on the Duck roster whose names don’t end in Mariota. At 6-6 and 290 pounds, Tyler Johnstone definitely has the size and strength to be a starting tackle at the next level. Johnstone’s size, strength, and quickness are what made him Oregon’s best lineman before his injury. The only thing holding him back from realizing his potential are his knees — well, his right knee to be exact. Johnstone first tore the ACL in his right knee during the Ducks’ resounding victory over Texas in the Alamo Bowl and then re-tore the same ligament a few weeks after being cleared to practice. If he can stay healthy, you will see him playing on Sundays. Marshall is currently playing (and excelling) at Oregon’s patented TAZR position — the same position that De’Anthony Thomas made so famous before him. The downside to this is that the TAZR position has not yet made its way to the NFL level. However, being able to line up in the slot as a wide receiver as well as the ability to effectively run between the tackles as a running back does give Marshall more versatility, which goes a long way when being evaluated by NFL scouts. This versatility is much like the way that the New England Patriots use Shane Vereen in the passing game as much if not more than they do in the running game. No matter what your official position is, when you put up 1003 receiving yards and 392 rushing yards with an average of 7.5 yards per carry, you can straight up play football. Before any player gets drafted into the NFL, from the 300-pound lineman to the 175-pound running back, everyone at some point runs a 40-yard-dash. Why? Because when you get to the NFL level, speed kills. And Devon Allen is fast — very fast. Allen is the reigning NCAA Champion in the 110-meter hurdles after setting an NCAA Championship record with a time of 13.16 seconds. What sets Allen apart from other track stars on the field are his hands and his ability to make people miss. And with his average of 16.7 yards per catch last year, look for him to be the Ducks home run hitter in 2015. I am not saying that Allen is a first or second round wide receiver right now, but with his raw talent and 3 more years of eligibility left, there is no telling what he can accomplish. I know this might be a little early to put him on this list considering he has yet to play a down of Division I-A college football, but the argument can be made that he still would have gotten drafted even if he had stayed at Eastern Washington, much like fellow FCS quarterback Jimmy Garoppolo did coming out of Eastern Illinois. If Adams can put up the video game type numbers he has the past 3 years at EWU for the Ducks this season, he could dramatically raise his draft stock and probably lead the Ducks back to the championship. With a solid season of Division-I football and a college playoff run, Adams could very well end up a low-first or early second-round pick in next years draft. If he does get selected in next year’s draft, hopefully Super Bowl winning quarterbacks Drew Brees and Russell Wilson can help put the whole “short 6-foot quarterback” argument to rest. 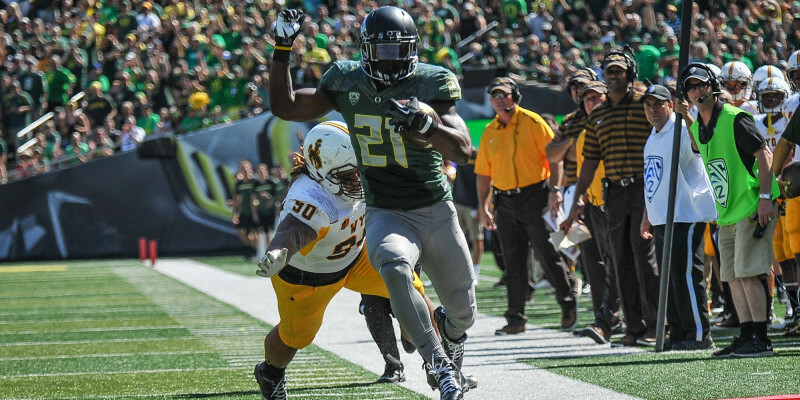 There is no doubt that “Rolls” Royce Freeman has the highest NFL ceiling out of all current Oregon players. Freeman is an extremely powerful runner who always seems to fall forward, and with a 6-1 and 229-pound frame it’s easy to see why. He already has an NFL sized body at the age of 19 and looks like a man among boys out on the field — not to mention that he is currently on pace to be one of the most prolific runners in school history, having broken LaMichael James’ record for most single season touchdowns by a freshman (with 18) — and he is the first freshman 1,000 yard runner in school history, with 1,365 rushing yards. But if you take away all of his physical gifts, his greatest asset is that he still has 3 more years of eligibility which should give him plenty of time to rewrite Oregon’s record book before setting his sights on the pro records.